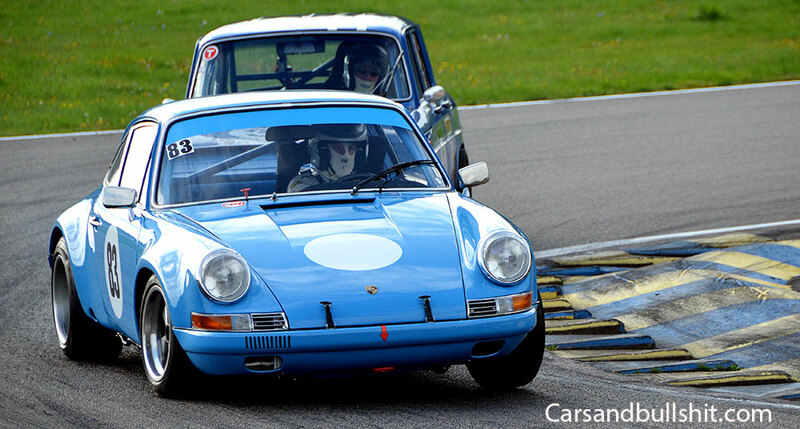 Take a look at this very nice 1971 Porsche 911 ST racecar. On the racetrack this is a very agile and competitive car, ready to take on its competition. The photo is taken at the Falkenberg Classics, Sweden’s own little Goodwood Festival of speed. This car is homage to the very famous Porsche 911 ST, a very rare car. 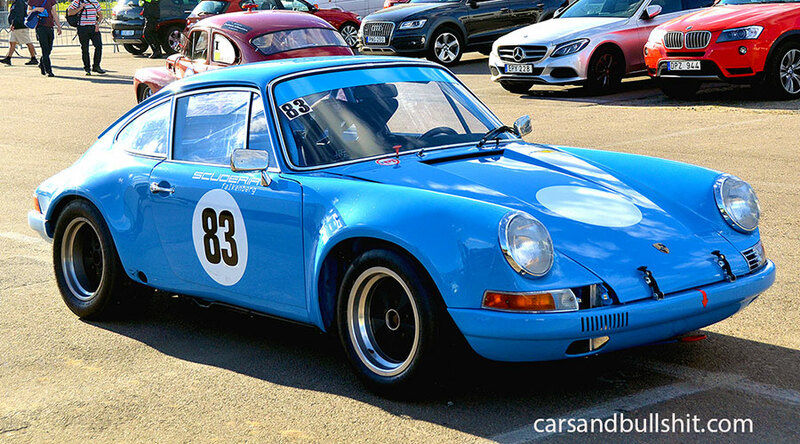 According to Scuderia Falkenberg who owns the car Porsche only built 20 of these fantastic cars and this one is painted in Porsches own pastel blue. The engine is built by the Swedish Porsche legend Bo Strandell and has been tuned to perfection. And it sounded and worked perfectly under the race. It has the nice original Fuchs wheels and Michelin tires. Compared to the original Porsche 911, the 911 ST was put on a nasty diet. Thinner gauge steel was used and customers could spec the car with Plexiglas windows and aluminum doors, making it very light. In the back you would find a wonderful 2.3 liter flat six with a triple-choke Weber carburetor delivering 230 horsepower. Not bad considering that the lightest cars only weighed in at just 840 kilos. The car was also available with a larger 2,5 liter engine, with 270 bhp. Swedish rally legend Björn Waldegård drove a 2,5 liter 911 ST in several rally’s and won the Swedish Rally in 1968. He also won The Monte Carlo Rally in both 1969 and 1970. 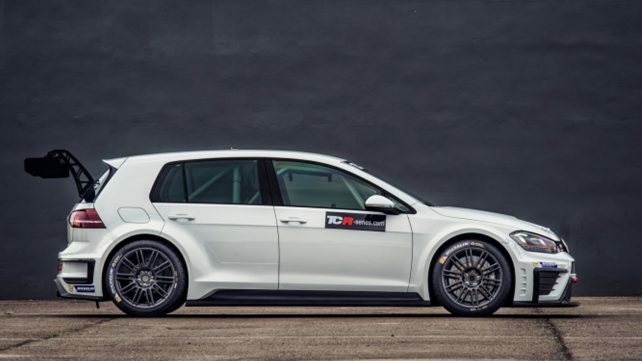 Very impressive, and with 270 horsepower on just 840 kilos the car is pure dynamite. Sweden has several classic car events, and the Falkenberg Classics is considered to be Sweden’s own Goodwood Festival of Speed. A couple of hundred classic cars raced each other on the short and fast racetrack. Last year was as usual very sunny and had a lot of spectacular cars, both on track and in the exhibition area. One of the nicer cars on the grid is driven by Hans Eklund. Hans is very fond of Saab cars, owns several classic models and is an experienced driver who has been racing for more than 25 years. 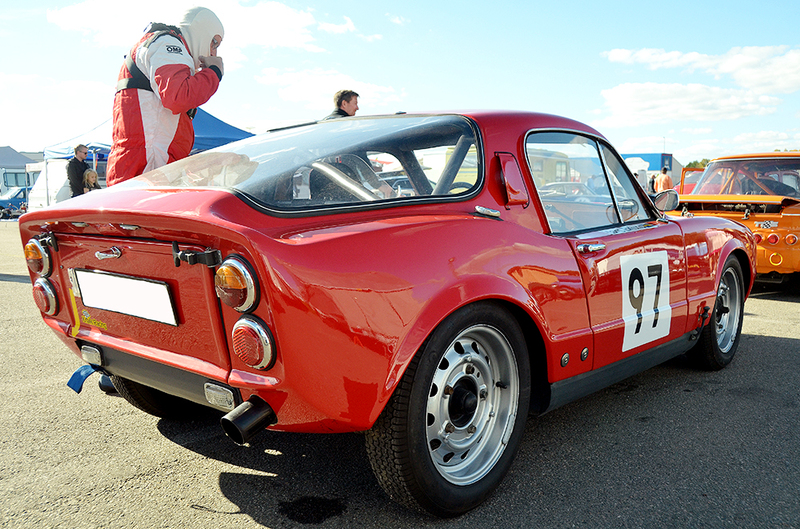 Hans is running a 1967 red Saab Sonett II. It’s a rare car, Saab only made 258 Sonnet’s in 1967. Under the bonnet sits the legendary great sounding 60 horsepower three cylinder 841 cc Saab two-stroke engine. Famous from the Saab Sport (also known as the Gran Turismo 850 or the 850 Monte Carlo), the sound this little engine makes when driven hard is remarkable. Ok, let’s be honest, The Saab Sonett II with the two-stroke engine is not a very fast car. However, like many other classic Saabs it is very fun to drive. Weighing in at 780 kilo (fiber-glass body), the 60 horsepower engine resulted in 0-100 km/h in 12,5 seconds. If you went flat-out you might reach 160 km/h, according to the beautiful Saab press-kit. I wonder how fast a Saab Sonett fitted with the engine from a Volvo Amazon 123 GT (1,8 liter, with 115 horsepower) would be. Back in 1967 it was rather expensive; it was actually the most expensive Saab that you could buy. Fortunately it was also, by far the most beautiful. 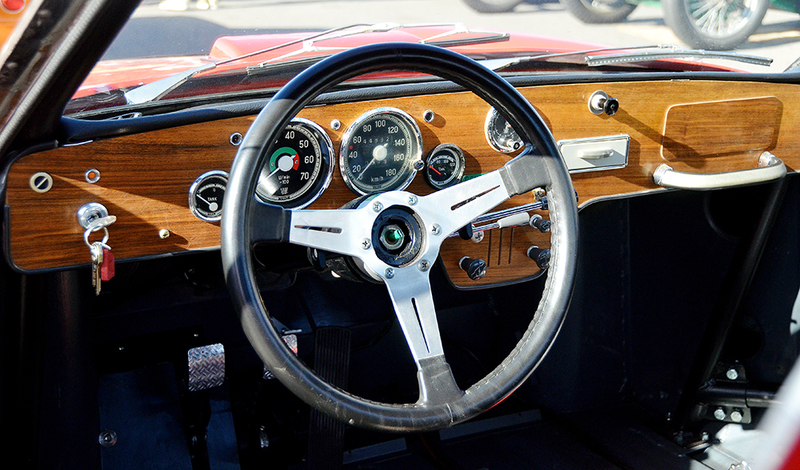 It came with bucket seats, leather steering wheel, had a dashboard in mahogany plywood with very nice designed gauges from VDO, and also a built in roll-bar. Remember, Saab is Swedish and has a tradition of building safe cars. Compared to later Sonnet’s the engine was quite easy to reach with the front hood section hinged forward. You just flipped it up and then you could easily access the little gem. At a different race at Mantorp Park there were a lot of other cars at the track and it was a pure joy to see the little Saab Sonett being chased by Chevrolet Camaros, Porsche 912: s and other monsters.